Leigh Road Baptist Church Pre-School recently raised awareness of Fairtrade products with the Mums of the children at their Pre-school. Christina Hayhurst and Lorrain organised a coffee morning get together for parents and pre-school workers. The gathering allowed relationships between the staff and parents to be developed and to offer advice on parenting etc. 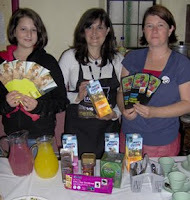 Products used at the event were kindly donated by The Co-operative Food and all were labelled with the Fairtrade mark. Visitors were also able to read about and engage with information on Fairtrade provided by the FAIRTRADE LEIGH campaign. Around 40 parents and workers attended and commented "they had a lovely time, which also raised their interest in Fairtrade, and they were surprised at how delicious the food tasted" Many pledged their support for the Fairtrade Leigh campaign. Thansk also go to local school girl Gabrielle Hayhurst who gave up her time to design the invites and serve coffee and tea on the day. If you are interested in holding and even. Do let us know about it and if we can help in anyway by providing a stand or ways of getting funding for some Fairtrade goodies. Email us by contact above.